On books, web sites, and blogs (including this one) you may have come across references such as the S&P 500 has grown 13% annually for the past 30 years or something to that effect. You may wonder what that means and where did they get that number. When someone states an annualized return, most likely he is referring to the Compound Annual Growth Rate, or CAGR. 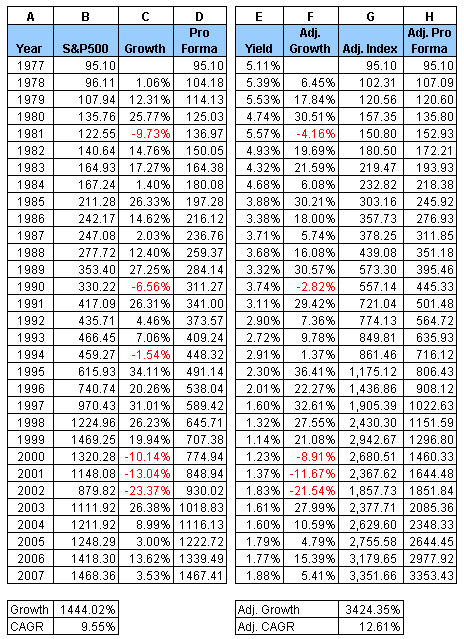 The S&P 500 did not return a steady 13% gain each year — in reality, some years it went up and some down. In the graph below, you can see the S&P 500 percentage growth adjusted for dividend yield. You can see that the growth rate is different each year. In fact, in 5 out of the 30 years it actually went down (table column F). Graphically, it is a graph smoothing function. In the graph below, you can see S&P 500 growth — blue line (table column B) represents investment growth, and green line (table column G) represents investment growth plus dividend yield. 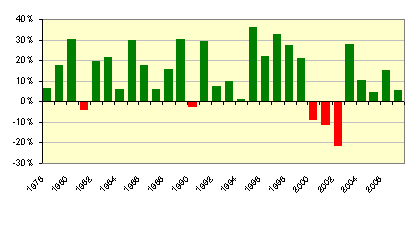 Notice that the two lines trend upward, but go up and down each year. 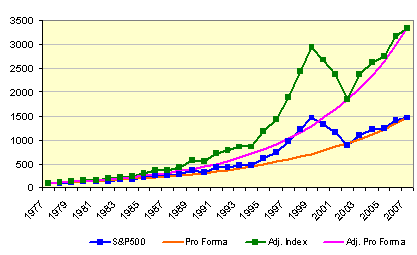 The two smooth lines represent CAGR of S&P 500 (orange, table column D) and S&P 500 plus dividend (purple, table column H). From the table below, you can see that CAGR of S&P 500 plus dividend yield from 1977 to 2007 was 12.61%. Of course, your actual return can be very different from this scenario. For example, if invested from 2000 to 2007, your CAGR would be a mere 3.24%! It is easily manipulated by adjusting the period being measured. For instance, I started investing in 1996, so my CAGR would have been 8.34% if I had invested in an S&P 500 index fund. What else do you know about CAGR that you can share with us? Please some one help me to get more information how the CAGR is derived and how to convince the court that it is the most suitable prediction of the growth or projected growth for an individual. What sort of reference can I give about CAGR when used in the court when I tried to estimate the loss due to lost of income..